This is fun photo for me. 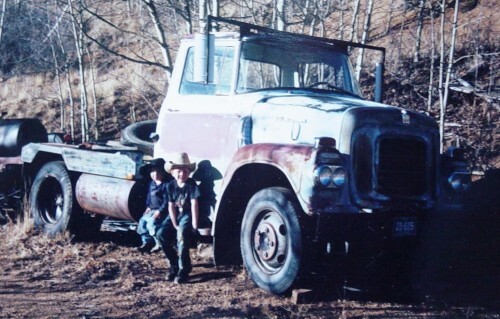 It shows our first two grandsons with the truck that was on their property when their folks bought it. The oldest graduated college last year (2015) and is now going to grad school. 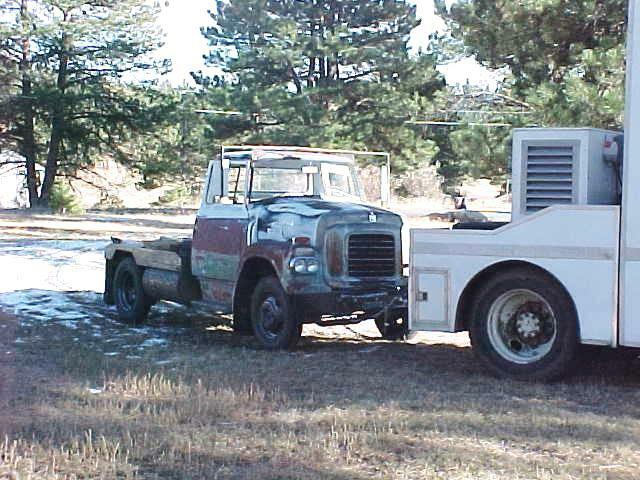 When our daughter and her husband bought their home (an old ranch house up in the mountains of Colorado), this truck was sitting on the property. Obviously, being the motorhead that I am, I kept looking at it each time we visited them. They found the owner and bought it for me as a surprise Christmas present (‘97) – boy what a special gift!! For that reason alone, it is special to me, but it is special for other reasons. I have become very involved with a bunch of “crazy “ IHC folks on the internet and have attended several of their events. They are great people! Lastly, it is a bit of a rare animal. The body was not too bad, but the engine was really stuck. I tried several methods to free up the engine, but nothing worked. I finally pulled the head and pan. From the pan side I applied pressure on the crank with a jack and on the head side, I made a wood block to match the piston diameter. It took a lot of pounding on the wood block but it finally broke loose. I put new rings an bearings in it and it ran fine. 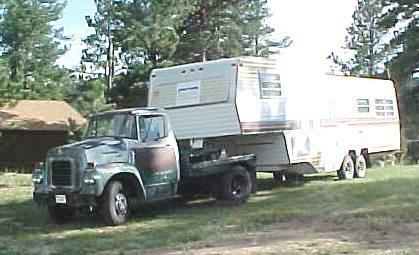 On November 11, 2001, I towed the BC-150 to our house. 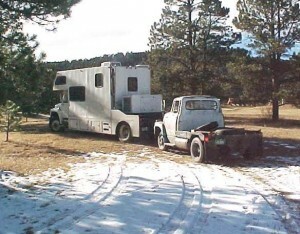 The photos below show the truck behind the IHC Toterhome I had built. In April 2002, I got the truck running. As of December, 2003, I had about 1,400 miles on it. I even used it to practice for my CDL driving test using a fifth wheel trailer that we had at the time (see photo below). I took the truck and trailer to a local school bus parking lot and practiced backing the trailer for hours on end. The six cylinder engine ran good, but lacked power for highway speed and big hills. Part of the fun of these projects is researching the history involved. Shown below are two magazine ads for this family of trucks. These are photos of actual magazine pages that I have in my collection. 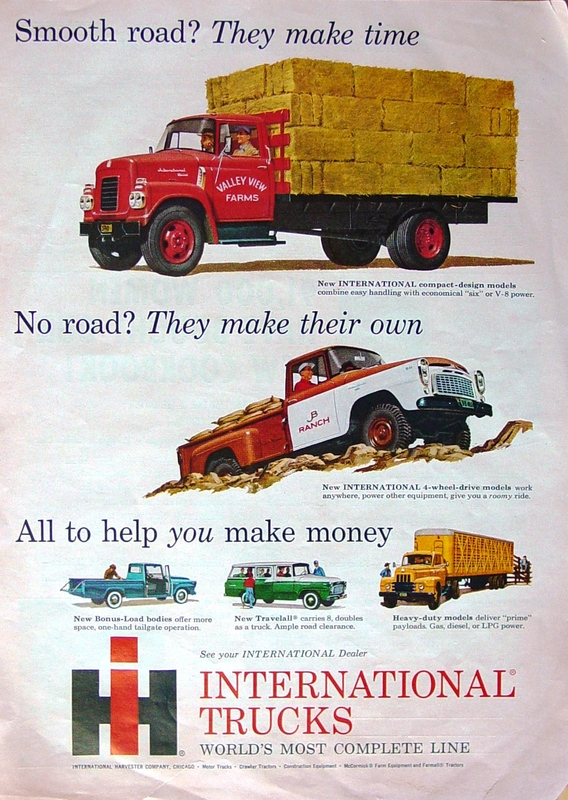 The ad on the left is from the inside cover of the August 22, 1960 U. S. News and World Report, while the ad on the right is from an unknown edition of the Farm Journal. Note: I have quite a bit more material that I want to add to this section – maybe some day. 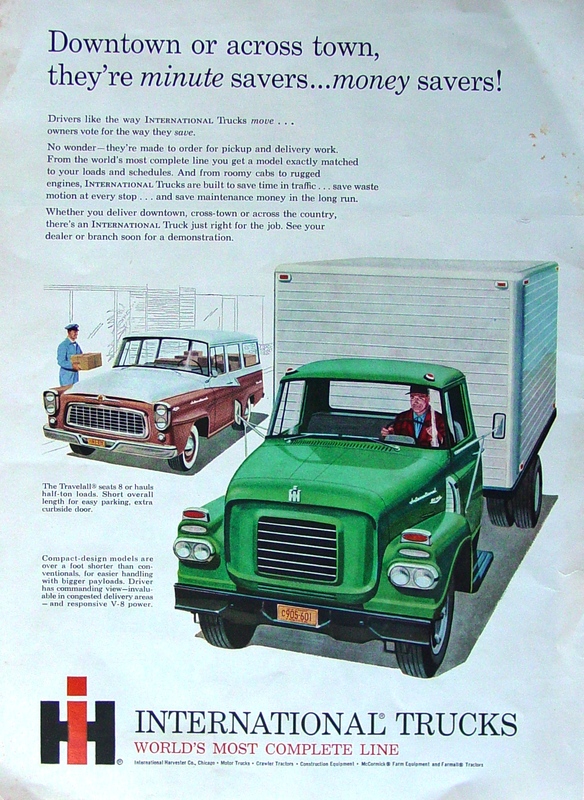 The truck is the forerunner of the Loadstar truck line and was their medium truck line for the period. It had a bit of a "cabover" format. The line consisted of a series of trucks from lightest model (BC-150) with the heaviest being the BC-180 (had a GVW of over 33K pounds – a couple of sources suggest GVWs up to 70K pounds). The 1959 BC-150 had a production of 660 while the next model (BC160) had 13,998 (for comparison, the "standard" versions had production numbers of 4492 for the B-150 and 45,606 for the B-160). The BC models were only made from ’59 to ’61. The small number of BC-150s produced make this truck a bit rare. I was able to obtain a copy of the line set ticket for the truck and it was equipped with the optional BD 264 six cylinder engine, T98 four speed transmission and a two speed rear end. It has a GVW of 9K pounds. In my research, I found specification sheets for the BC-150 model BC-150 Specifications. If you look closely, there are two different frames for the various wheelbases. For the 167 inch wheelbase, the frame is bigger. The frame on my truck has been shortened to 126.5 inches (you can see the welds and there was some reinforcing). Measuring the frame would suggest it is the heavy version. I will be lengthening the frame by 36 inches so it will be close to the longest wheelbase offered. The now famous Loadstar line started its long production run in 1962. The BC line was an experiment to make a truck that was a combination of a cab-over and conventional truck. Because of the relatively short nose, the engine compartment extends into the cab more than most trucks.